Women’s event supports other women in the community. Call it a case of women in the community helping other women through their time of need. Gillian’s Place’s Joanne Doyley (middle) accepts a donation of $3,950 from Amy Wilson (left) and Susie Turner of Romby’s Tavern & Smokehouse. The funds were the proceeds of the Lake Street tavern’s Ladies’ Night event held in November. By Melinda Cheevers, Niagara This Week. 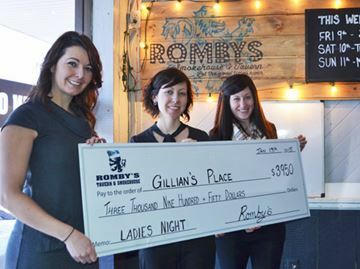 Romby’s Tavern and Smokehouse on Lake Street held its annual Ladies’ Night event in November, inviting women into the tavern for an evening of shopping, socializing and fundraising. The evening included small businesses and vendors from around Niagara setting up display tables around the perimeter of the bar. Guests were able to get some holiday shopping out of the way while participating in raffles and draws to raise money for this year’s chosen charity. Over the past four years, organizers Susie Turner and Amy Wilson have chosen different organizations that cater to women either on a whole or through specific programming. Past events have benefitted the Canadian Cancer Society, Hospice Niagara, the BoxRun Foundation and Welland Hospital Foundation’s fundraising campaign for a mammography unit. This year, they chose Gillian’s Place, an organization that provides safe shelter with a full range of support services for abused women and their children from Grimsby, Lincoln, Niagara-on-the-Lake, St. Catharines, Thorold, and West Lincoln. “We heard they were a wonderful organization to work with,” said Turner, adding they’re happy to help an organization that’s doing so much to help women in Niagara. Last week, Turner and Wilson presented Gillian’s Place Fundraising Events Coordinator Joanne Doyley with $3,950, the proceeds from Ladies’ Night. Gillian’s Place needs to raise $500,000 a year to maintain its current operations, which includes a 24-hours a day telephone counseling line, a 34-bed shelter, emergency clothing and meals, family law advice, children’s counseling and support programs for women in the community fleeing from violence and more. “Small events like this are crucial,” said Doyley, explaining that the organization’s large fundraisers like the Walk for Women and Walk a Mile in Her Shoes campaigns help them to bring in the lion’s share of that total each year, but it’s the small events that bring them to the finish line. Over the past four years, the Ladies’ Night event has raised close to $11,000 for the community. This year, the boys from the bar even got involved, putting in a team of four to participate in Gillian’s Place’s Walk a Mile in Her Shoes event in October. Turner and Wilson said the event wouldn’t be as successful as it is without the support from community partners, from longtime vendors like Gypsy Alley who come back year after year to other local businesses, like Hendriks Greenhouses, who donate prizes.